‏A possible harbinger of a new Orthodox conversion body in Israel has emerged following a training course for rabbis to specialise in Jewish conversion law at the Harry O. Triguboff Israel Institute for Conversion Policy at Beit Morasha in the capital, designed to provide them with the tools to work as voluntary rabbis in the State Conversion Authority. ‏Twenty four neighborhood rabbis and heads of yeshiva marked the completion of a year of intensive studies. Seven rabbis of the group are Russian speaking, playing an important role in the Russian speaking community. The idea according to the institute director Shalom Norman is that the rabbis will boost these conversion courts’ ability to function, thus increasing the numbers of converts amongst the estimated 300,000 FSU immigrants who are not Jewish by Halacha, in the same way that rabbis are recognized by the state to voluntarily perform weddings. But for them to join the existing conversion courts would take a cabinet decision and, more important, the acquiescence of Chief Sephardic Rabbi Shlomo Amar. Should he refuse this addition to the system, these 20 rabbis – and many more who will undergo similar training – could pose a clear alternative to Israel’s Orthodox conversion system, which is failing to draw non-Jewish Israelis to its conversion courts. It is possible that this subtle, implicit threat to the Chief Rabbinate of an alternative system could galvanize the rabbinate into accepting these volunteers. ‏Speaking at the event, Justice Minister Yaakov Neeman slammed the Chief Rabbinate for its conduct – or lack thereof – on conversions, but stressed the need for these newly trained rabbis to act from within the system, as the law allows them to. Neeman discussed the work of the committee on conversions he headed over a decade ago, which recommended that the rabbinate form a conversion authority, and an institute for Judaism studies. Because of the latter recommendation – which became the Beit Morasha center – the Chief Rabbinical Council refused to recognize the Conversion Authority. “By rejecting the committee’s recommendations, the Chief Rabbinate is responsible for the current situation on conversion. They rejected the recommendation even though it determined that conversions would be done according to Torah. This is a heavy charge sheet I’ve been carrying in my heart for over 10 years,” Neeman said, emphatically. The justice minister further said that already two years ago, the Attorney-General’s Office had announced that there were no legal grounds to prevent volunteer rabbis from reinforcing the Conversion Authority. “I call on the Chief Rabbinate, if it wants to stay [the Chief Rabbinate] of all the Jews here and not just of a certain sector, to come immediately to appoint rabbis. I call on the rabbinate to see conversion as a national mission of the highest priority,” said Neeman. Queries to the Chief Rabbinate regarding Neeman’s assertions remained unanswered by press time. Prof. Benny Ish Shalom, president of Beit Morasha, stressed that “we are not declaring war on the Chief Rabbinate, rather saying that the system should be rocked to reach a significant breakthrough.” Earlier in his address, Ish Shalom noted that more than 90,000 children born in Israel to parents from the former Soviet Union, whose sole identity is Jewish-Israeli, are in fact not Jewish by Halacha. “We expect Amar to agree to accept these volunteer rabbinical judges,” he said. “Everybody understands that if the great need [for conversions] is not answered by the rabbinate, many rabbis who see this as their responsibility will put themselves forward for it. If the state’s rabbinical system does not meet the expectations, alternatives will arise. “We would prefer that everything take place in cooperation with the Chief Rabbinate,” he said. 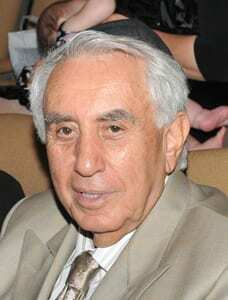 Harry Triguboff is a Sydney-based property developer.